Vehicle Inspection Officers popularly called (VIO) which is saddled with the responsibility of inspection and issuance of roadworthiness certificate (RWC) to all vehicles as well as ensuring that vehicles plying Nigeria roads are roadworthy appears to be in dire need of maintenance themselves as they have become intoxicated with the carrot of extortion which is almost synonymous to most law enforcement agencies in Nigeria. Investigations carried out by SecretReporters reveal that the Vehicle Inspection Officers who are mainly found standing at the popular DSC roundabout junction in Warri arrayed in white and black uniform turned brown, in a bid to collect their own share of the National cake using the masses as their work station allegedly extorts at least N50 (Fifty Naira) from every transporter especially tricycle (Keke) operators that ply the road. This according to sources has caused tricycle operators to churn out other routes in order to avoid the menace of the overbearing officers. It was gathered that due to the lucrative nature of the daily extortion exercise been carried out by these V.I.O officers, men of the Federal Road Safety Corps (FRSC) who are also stationed at the same location now engage in this extortion spree. 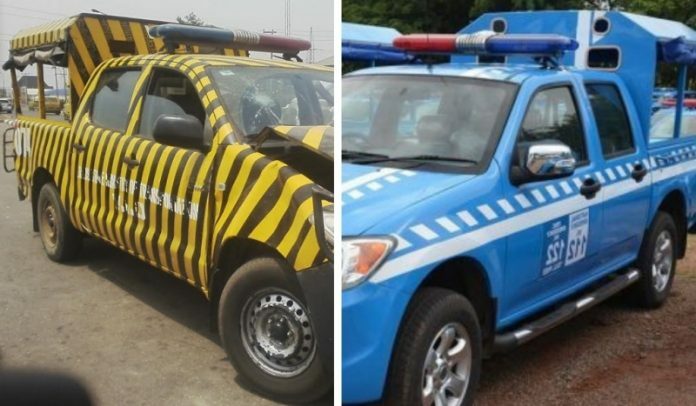 This according to information has allegedly resulted in several confrontations between officers of FRSC and V.I.O and sometimes almost leading to fights over who has jurisdiction to stop vehicles and tricycles as whoever is first to stop these road users is entitled to collect the illegal N50 (Fifty Naira). A tricycle operator who spoke with our reporter lamented that these heinous V.I.O officers who appear to show utmost disdain for the law they were supposed to enforce is alleged to show little or no care if their papers are complete nor bother to check the roadworthiness of vehicles and tricycles, but immediately requests for “matching” (N50) as it is popularly called before they are allowed to pass. There are speculations among tricycle (Keke) operators within Warri metropolis that if this illegal extortion by the Vehicle Inspection Officers (VIO) is not quickly checked by the relevant authorities, it may grow into a monster with horns.